Much comedy output comes with the disclaimer: ‘Not for the easily offended.’ But that’s precisely who SHOULD be reading this book about how jokes can backfire. The Sacred Art Of Joking is not so much aimed at those who already know the finer points of comedy, but those who might see a gag repeated on impersonal newsprint and splutter over their cornflakes about how outrageously out of order these comedians are for thinking a sensitive matter could ever possibly be funny. For them, James Cary explains how comedy works. How saying the most inappropriate thing can be funny – and most importantly how context is all, not least because a joke depends on a delicate understanding between the teller and the listener and even the subject of the gag, a fragile relationship inevitably lost when a punchline that stormed in a theatre is repeated under the sterile scrutiny of a news report or court case. Cary can stake a reasonable claim to know what he’s talking about. He wrote the BBC Three comedy about a bomb disposal unit, Bluestone 42, and the Radio 4 sitcom about Bletchley Park codebreakers, Hut 33. He’s been on the writing team for Miranda and hosts the behind-the-scripts podcast Sitcom Geeks, among other credits. He also sits on the General Synod of the Church Of England, and might be considered the very voice of the conservative, religious middle classes among whom mid-market tabloids try to provoke outrage. He is certainly one of the few comedy writers who admits considering the words of Ephesians 5.4 before putting a swear word into the mouth of one of his characters, while citing other Biblical precedent for bad language and for causing offence. The Sacred Art Of Joking is published by the Society for Promoting Christian Knowledge, and even includes chapters on whether it’s advisable for vicars to ‘gag up’ their sermons, and making the case that their is humour in the Good Book, even though it’s rarely drawn out in readings. Some of his examples from the Bible seem like a bit of a stretch as examples of comedy, but it’s probably the way the apostles tell em. In any case, the notion that Jesus was subversive and used stock tactics to make his points is a good one to bear in mind today. Cary offers his take on some hot potatoes, from the ‘Nazi pug’ YouTuber Mark Meechan to the familiar cry of the Christian Right ‘why can’t you make jokes about Islam?’ to Jerry Springer: The Opera which so offended some of his Christian brethren. Although Cary is charitable, to say the least, when he says Christian Voice’s Stephen Green ‘found himself to be at the forefront of the campaign against the show’ – when in fact the prominent homophobe was almost solely instrumental in orchestrating it. It’s fair to say Stewart Lee and Richard Thomas’s foul-mouthed opera was not to Cary’s taste, but he even-handedly acknowledges what the piece was trying to achieve, and ultimately comes down in favour of its right to be performed. He draws an interesting contrast with Christian Voice’s outrage with the way the Church Of The Latter-Day Saints engaged more positively and forgivingly with The Book Of Mormon. And unlike many of the Jerry Springer’s critics, he has at least actually seen the opera. Cary is a voice for an understanding of comedy, even when you don’t agree with it – a point that could be taken by the more intolerant ‘liberals’ as well as the conservatives this book is apparently aimed at. Let’s hope it is heeded. 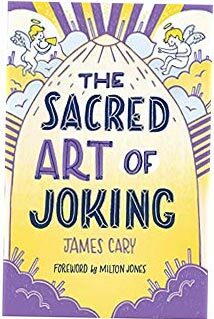 • The Sacred Art Of Joking by James Cary was published yesterday by SPCK. Click here to buy for £7.91 from Amazon.